This is the smallest owl species in Africa weighing between 50 and 90 grams. They are extremely camouflaged, looking just like a piece of twig. They come out at night and hunt insects. 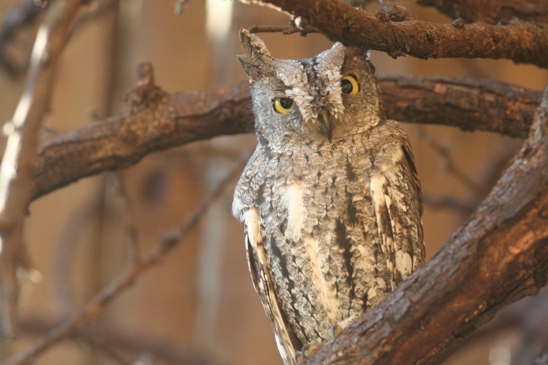 The African Scops Owls resident to theowl house at the Sanctuary are named Twig & Lichen.Twig was damaged in a severe wind storm in the Dullstroom area and Lichen later joined him from Brits. Although they are the smallest owl species in Africa, weighing 50 to 90 grams, they even eat scorpions.